In English, there’s no risk of confusion between “never” and “ever,” which have opposing though not quite opposite meanings. In French, however, both terms can be translated by jamais, depending on what’s in the rest of the sentence. Je n’ai jamais grimpé dans un arbre. I’ve never climbed a tree. Il ne veut jamais sortir avec nous. He never wants to go out with us. Je n’y retournerai jamais. I won’t ever go back there again. Jamais nous n’aurions pensé qu’il puisse faire une telle chose. We would never have thought he could do such a thing. 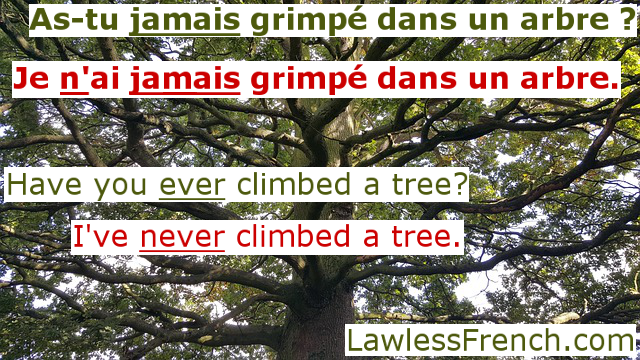 As-tu jamais grimpé dans un arbre ? Have you ever climbed a tree? Saurons-nous jamais ce qui s’est passé ? Will we ever know what happened? Je ne sais pas si j’ai jamais vu ce film. I don’t know if I’ve ever seen this movie. 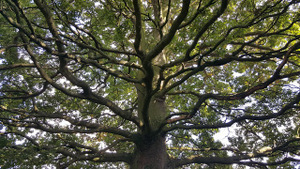 As-tu déjà grimpé un arbre ? Have you ever climbed a tree? Je ne sais pas si j’ai déjà vu ce film. I don’t know if I’ve ever seen this movie. Mon frangin [ne] fait jamais la vaisselle ! My brother never does the dishes! Elle [n’]est jamais à l’heure. She’s never on time. They are forever united in death. That story is lost for ever and ever. Il est mignon comme jamais. Previous Au revoir, l’anglais ?